Identified by its high, dome-like shell with hinged plastron, color and pattern is highly variable. Males typically have red eyes, females have brown eyes. Adults reach 4-6 inches long. Woodlands, forest edges, fields and stream banks. South of the Great Lakes, east of the Mississippi River into Mexico. Young eat earthworms, slugs and snails, while adults dine on berries, fruit, fungi (can eat varieties poisonous to humans), insects, crayfish and bivalves. Average is 50 years; record is 140 years. Females dig nests from May through July and lay 2-8 eggs. They can lay 5-10 clutches per year. Incubation is 70 -114 days. Males will hatch if the nest is 82 degrees or less; females will hatch at 93 degrees, with a mix hatching between 83 and 92 degrees. Not officially listed as endangered or threatened, but habitat loss, car fatalities and over-collection for house pets have made this species uncommon in recent years. 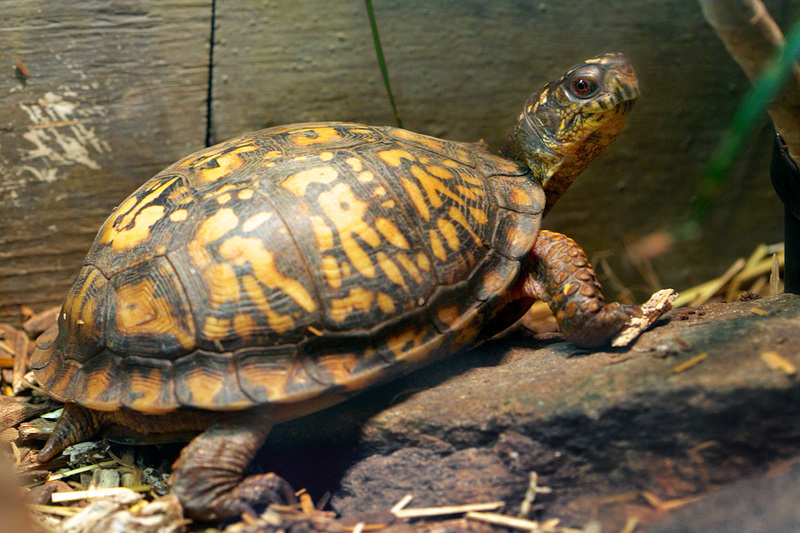 The Eastern Box Turtle is named for its ability to close its shell tight like a box. Its plastron is hinged so it can draw its under shell up tight against its carapace (top shell). Individual animals over 100 years old have served as “living records” with Native American fathers and then sons carving their names on the same shell. 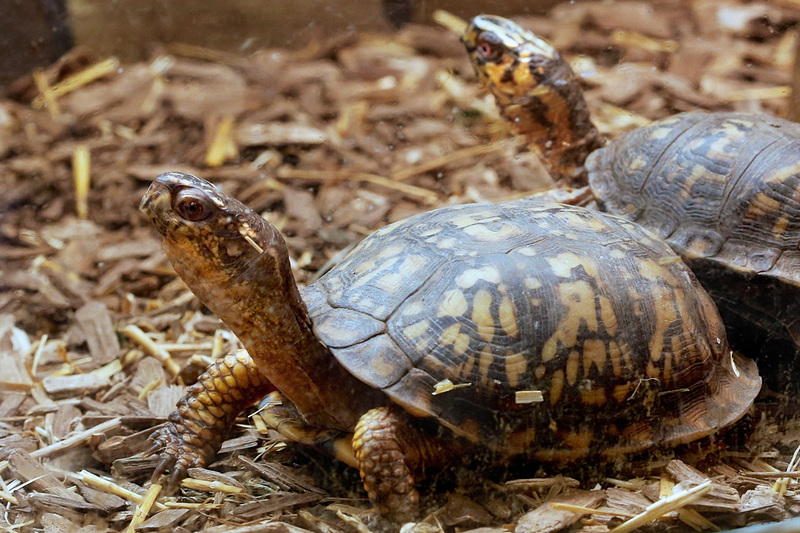 Visitors at Connecticut’s Beardsley Zoo will find Box turtles as well as other native species in our Connecticut Reptile building located in our New England Farmyard area.